"The Bicycle Specialty Store" is the grand result of a 80 year-old dream. In the year 1934, a young carpenter by the name of Julius Pahal was given the task of tearing down an old abandoned church at 107th avenue and 97th street here in the city of Edmonton. In exchange for his labor he was given the lumber to do with as he pleased. From nothing more than his dream, some old wood, and a lot of hard work, sprung the humble beginnings of a business that today is celebrating its 80th anniversary. 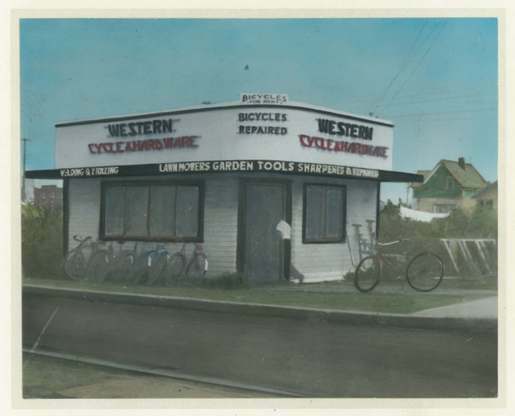 The business was Western Cycle and Hardware, and it was located at the corner of 124th Street and 104th Avenue (Stony Plain Road). Julius was joined by his brother Bill in 1937, each doing a tour of duty during the Second World War - Julius first with the RCAF and Bill with the Royal Canadian Navy - yet both managing to contribute time and effort into the little store on the corner. In 1949, Bill bought the building and property. Now sole owner he and his wife Evon worked towards building a bigger and better store. With son Jerry working after school and on weekends they were well on their way. The building that we see today on that same corner, was erected in 1957 with the cycle shop occupying a portion of the main floor. When Bill and Evon retired in 1970, Jerry purchased the store with the help of his wife, Joy, and son Bill, who joined the firm full-time in 1979. With a newly constructed warehouse on 123rd Street, the considerably expanded business now known as Western Cycle Ltd., occupies the entire two story building.